The mission of the AQSS is to "promote an understanding, appreciation and knowledge of quilt making and its heritage in Alberta and beyond". Appointments were made for about a dozen quilts and as each quilt was spread out and documented, we learned about the quilter, the fabrics and the patterns that are all part of the quilt. I didn't bring any of mine to be documented, but will probably do so in the future. I am pretty good at taking photos of the quilts I make and putting labels on the quilts I have sold, but I am not so great at doing the same for the quilts I keep for my home and the ones I gift to family. So, last night, I set out to make a list of the quilts I currently have at home that are being used on a daily basis and there are at least 13 that do not have labels. Some of them I know when and where they were completed, but for others, the details are getting fuzzy. If I don't remember, how will I ever expect my family to? Quilts documented will be added to the records of the Royal Alberta Museum and eventually added to the online records of The Quilt Index. 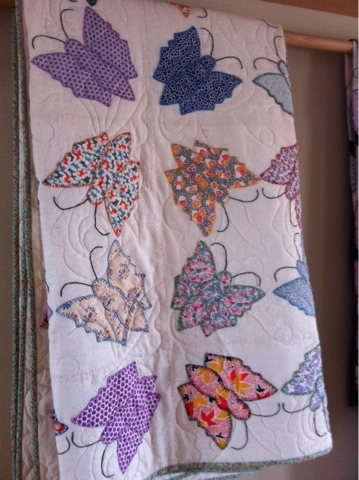 Do you have antique quilts? Quilts without labels? Does your family know the value of the quilts that you have made? Do you? Stay tuned to find out what you should include on your quilt label! Victoria Quilts is a great program that provides quilts to people with cancer in Canada. You can find them here at http://www.victoriasquiltscanada.com/index.html It is one of the many charities that take donated quilts and a great cause. This quilt became part of the Victoria quilt story when my quilting friend Joyce brought a quilt top to our Monday night meeting of the Fabric Stashers quilt guild and said she didn't want it and wondered if I could use it. Never one to turn down a bargain (this was a huge quilt! ), I took the top home, thinking I might take it apart and make two quilts for Victoria Quilts sometime in the future. After a few times of spreading it out and looking it over, and talking it over with my long-arm quilter Marie, it was decided that we would leave the quilt top intact. 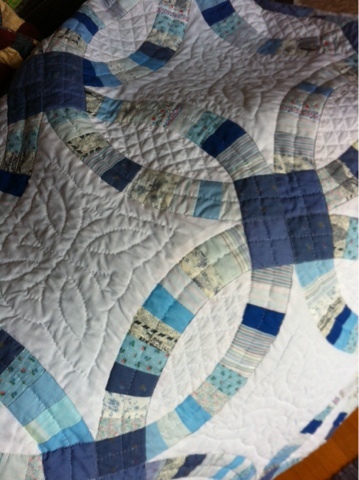 She would quilt it, I would list it in my Etsy shop and when it sold, the profits would be donated to Victoria Quilts. I found a backing fabric, and brought it to Marie's for quilting. Fast forward a few more weeks and I receive a request for a queen size quilt for a Christmas gift. Not having any currently made and ready to ship, I sent off a quick response that I didn't have one and was not taking any more custom until 2016. Later that day, I remembered this quilt top that was waiting for quilting. I sent a note back to the customer that I did have something, not one that I personally made, but would be great for her husband's Christmas gift. 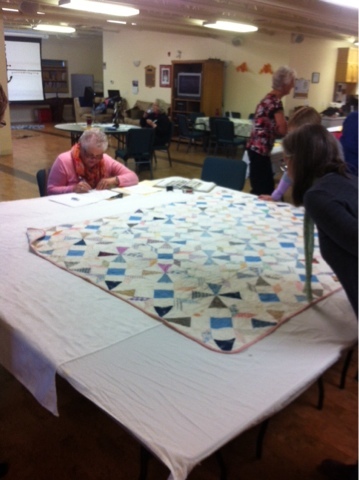 She loved the quilt and the fact that the funds would go to such a great cause! 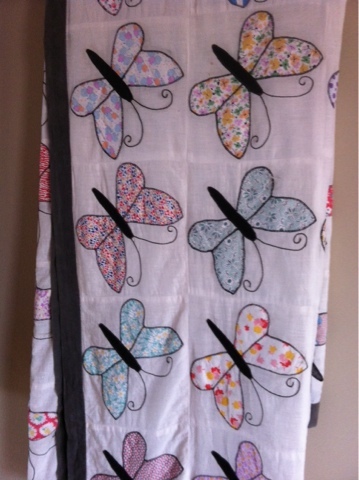 So, a quilt top that someone no longer wanted became a beautiful gift for a special person and enabled a good donation to a great cause! Do you donate to any special causes? Have you got a project that is sitting in your closet that you no longer love? I would love to hear how you give back to your community! And here's a couple more quilts made for a customer that loves reds and grays and blacks. Red & Gray square in a square - SOLD! The square in a square block is a pretty basic block and I chose to do it with a common center of red fabrics, but it's also very effective when made with alternating blocks of a dark outer square with a light inner square and a light outer square with a dark inner square. Christmas Present Runner - SOLD! And the Christmas present runner is one that I've seen many times online - I didn't look for a pattern, but just drew this one out on graph paper & put it together - I may make this one again will some more traditional red & green Christmas fabrics! It's Hard Running an Online Business without Internet! After months of no internet at home, I'm finally back connected on a regular basis and ready to begin posting here a little more frequently. I have gotten to know my local coffee shops with free WiFi and have spent more time face to face and it's been a good summer. I did manage quite a few finishes and this disappearing friendship star was one of them. I blogged about the block back in April here. I have been looking at many quilts online that have been "quilted to death" and thought I might like to try quilting with some dense quilting and practice my free-motion quilting at the same time. Click on the photos to zoom in closer if you want to see the quilting patterns more clearly. I am glad to have this one done and ready for use - it is up for sale in my Etsy shop here. Although I enjoyed the process of quilting this table topper, I still prefer my quilting to be less dense and a little more free form than this, but I will keep trying different things﻿ as I love to learn new techniques!